Love to hit the beach in the summer time? Even if you’re landlocked with dreams of the ocean, this “Style” post is for you. “Surfer” style is all about staying cool and comfortable in loose-fitting, colorful clothing. Don’t forget your swimsuit! This outfit is all about bright colors and staying cool in the hot summer sun. The top fits loosely yet still offers some shape, perfect for throwing over your swimsuit or layering with a bright pink or blue tank. Jean shorts are a must in the summer, the more destructed and “chill” the better. Sinful swim offers a variety of bikinis, and this pink color looks great under this top. Add a simple pair of flip-flops and some fabulous neon wayfarers to complete the look. The beach can get chilly at night. This outfit is just what you need for a bonfire and cookout after a day of fun in the sun. Light-weight sweatshirts are comfy and warm, perfect for layering over a tank or swimsuit. Jean skirts are a must for this look, cute and easy to throw on over a bikini, and the bling on the back pockets add a little flair to your outfit. Throw on a cute yet simple pair of flip-flops and you’re ready to hit the BBQ by the water. Need the perfect dress for that beach party or date but don’t want to give up comfort? Maxi dresses, like this one, are the perfect summer style. Dress them up with simple heeled gladiator sandals, like the ones shown here, and big bangles. You’ll be ready to stroll down the beach hand-in-hand with your cutie in this outfit. Check out our website at www.gliks.com for these products as well as other fabulous items. 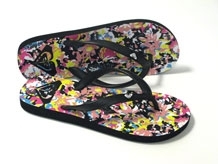 Looking for more comfort than the regular flip-flop can give you? 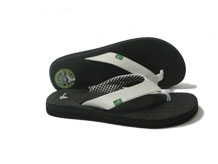 Make sure you get the new Yoga Mat flip-flops from Sanuk. The name says it all, these shoes are made out of the same material used to make yoga mats. You can’t get much more comfortable than that.